When a loved one passes away, among all of the other challenges and difficulties, there comes the need to divide the jewelry portion of the estate. Arriving at a fair and equitable division can be tricky, but this article should help guide you through some of the issues. Navigating the complicated issue of inherited jewelry. Before we begin, if you would prefer more personalized information, please feel free to reach out to us. We offer a free consultation where our jewelry experts will sit down with you and explain the different types of value and how they relate to your particular jewelry. Jewelry, to many people, is a “caveat emptor” or “buyer beware” area of life. How a small polished rock can be worth the same amount as a car or a house will never be understood by some people. A big reason for this is that evaluating jewelry and arriving at an accurate value is not an easy skill set. It requires vast, detailed knowledge and experience together to do well. 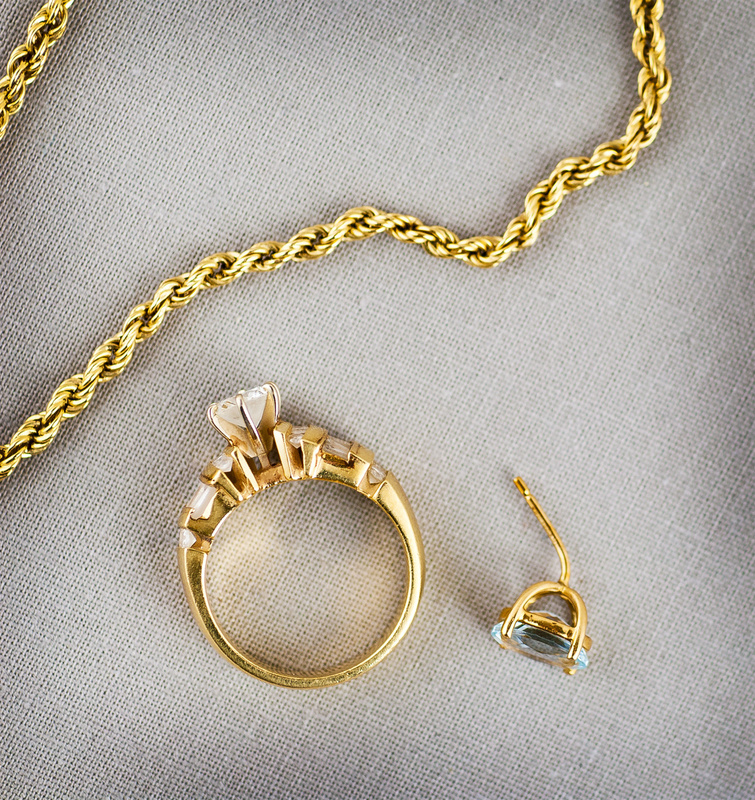 As a result of this, dividing up the jewelry in an estate can often lead to distrust and frustration. The key to creating the right atmosphere to have an equitable division of wealth in an inheritance situation is to set the jewelry value at a standard that everyone understands. The two important points there are: the jewelry value standard and everyone understanding. If either point is missing, then the equitable division of the jewelry is in doubt. Like most products, jewelry value is not one set number. It changes with the situation (who is buying, and who is selling) and the marketplace (global economy, commodity prices, local jewelry market, etc.). And, it changes with time and styles. Unfortunately, jewelry value is not as simple as the cash a piece could be sold for at any given time. For example, the jewelry value of an item could be $1,000 given one set of conditions, but in a certain area, given the way it was put out to market, the condition of the item, the photo in the ad, and a million more factors the seller may only find a buyer willing to pay $800. This does not change the jewelry value. It simply means that the current owner could only find a willing buyer at that price. So, how can we fairly determine how much a piece of jewelry is worth? The standard of value establishes the dollar value of a jewelry item based on a set guideline. The same item of jewelry can have at least four different dollar values. For example, an item of jewelry can be valued at $3,000, $1,300, $800, and $300. All can be true and valid. How can one item of jewelry be worth both $3,000 and $300? It is the standard of value. There are four main jewelry appraisal standards. Each standard prescribes a set of guidelines for determining jewelry values. The four standards are: replacement price, estate value retail, estate value wholesale, and intrinsic value. Choosing the correct value standard for the inherited jewelry is critical to an equitable resolution for the family and friends. The most popular jewelry appraisal is an insurance appraisal for replacement purpose. Many people only know of this one type of appraisal. It produces the highest price for jewelry value. It is a theoretical value based on how much it would cost to replace the jewelry item with a new one. It is not the value of the jewelry itself, but what a new jewelry item like the piece would cost. As a classic example, under a replacement price standard of value a 2000 model year Toyota Camry car would be valued at the current price of a brand new Toyota Camry. Of course, there is no way that the 2000 Camry is worth that much when trying to resell it, but that is its replacement price, and that is the value that an insurance company expects to see. If you’re interested, you can read more about the different types of appraisals. The replacement value insurance appraisal has the least correlation to the actual market value of the jewelry item. So, even though insurance appraisals are commonly available, this would be the least accurate standard of value to use when dividing inherited jewelry. The next standard of value has a direct link to the jewelry item. 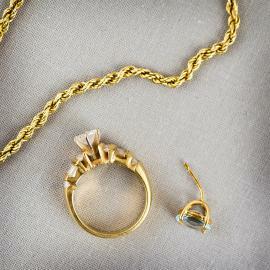 The estate jewelry at retail value estimates the price an item would sell to a used jewelry customer. The word “estate” in this context simply means used or pre-owned. When someone chooses to buy a piece of used jewelry, excluding cases of rare or highly sought after pieces, one of the main motivations is to save money. A used piece of jewelry will be worth less to the general public than the same piece that is brand new. People generally shop on eBay, Craigslist, LetGo and other classified ad sites/apps to save money. To accurately arrive at the estate jewelry at retail value you must find one of these end user consumers to buy the used jewelry. If you decide to go with this value, checkout our articles on how to sell jewelry on eBay and Craigslist to get some tips and tricks for staying safe and getting the best value for your jewelry. The estate jewelry at wholesale value is the price a business who sells used jewelry is willing to pay. This price will be lower than the estate retail value because of buyer needs to add all the cost of business to sell an item plus some profit. The jewelry needs to be in resalable condition and style. Compared to the estate value at retail, this value is generally easily converted into cash. Therefore, it may be the best value for a resalable jewelry item to be valued at for the inheritance. Intrinsic value looks at jewelry as raw materials. The last standard for value of jewelry is the easiest to understand and yields the lowest price. The intrinsic estate jewelry value is how much the raw materials that make up the jewelry are worth. For almost all fine jewelry, it is a combination of the current metal value and gem value. No value is added for style, condition, brand, market demand, or other factors. One quick warning, many “cash for gold” businesses do not pay for the gems. So, their offer can be significantly lower than even the intrinsic value of a piece. We have even heard of cases where a ring with a one carat diamond and $50 in scrap gold was valued at $50 by these operations. The intrinsic values for the gems are based on the cash wholesale price of the gem minus any cost for re-cutting or re-polishing the gem if it is worn or cut in an obsolete style. Intrinsic diamond and gem prices are not readily available like precious metal prices are to the general public. The gold, platinum, and silver prices are well publicized. The diamond and gem wholesale trade keeps their prices confidential, so there can be a large difference in these prices depending on the dealer you talk to. Using this standard can lead to a value that is significantly lower than what a piece is worth for resale (even quick sale). So, like the replacement value standard, even though it’s easy to understand and somewhat easy to estimate, the intrinsic value standard may not be the best choice for your inherited jewelry items. Clear communication is the final piece of the puzzle. Generally, one or a few people are responsible with the deposition of the estate. Making sure everyone is on the same page as to the value standard that is being used for the jewelry aspect of the estate is important to equity. It may not matter what standard is used as long as everyone understands what it is and it is applied equally to all pieces in the estate. The two important points there are: the jewelry value standard and everyone understanding. Integrity and transparency are also crucial to making this process work. For example, if a jewelry item has a replacement value appraisal and that value is used as the estate wholesale value, then there is a clear misuse of the jewelry value which will lead to an inequitable division. How the jewelry value is determined is crucial to the people receiving an inheritance. A full and open disclosure of how the jewelry was valued allows for a fair and smooth disbursement of the estate. Keep in mind that we have outlined four common standards of jewelry value here, but this is not an exhaustive list. Some issues outside of standard jewelry evaluation center on personal value and experience. An heirloom jewelry item can have great value to some and to others it is just old. Establishing an heirloom value is very personal. Such a piece may be worth 100 times its market value to the right person. Some jewelry is viewed as a birthright having a value that goes beyond price. Also, the fact that a loved one cherished a jewelry item creates an emotional value that has no price. All these and more attach some of the strongest value to jewelry, but a professional jewelry appraiser has no way of establishing or measuring this value. In the end, it is up to the family to work out a just solution. The desire to have a fair equitable division of a jewelry inheritance is doable. Having everyone understand the standard that the jewelry is valued at is the first step. Open and honest communication is another step along the way. We wish you the best with all of the emotions and issues that surround inheritance, and we are here the help if you need guidance on choosing a value standard, evaluating your jewelry, or selling it for a good price. Just contact us and let us know what we can do. Hi, I am about to inherit quite a lot of jewelry from my mom. She has traveled to many places in the world and has stones and gem stones that she has said are worth quite a bit. I know that can be a broad number, and as much as I want to keep, I can’t keep it all. My main concern is that I have to sell the house, I live in a different state, I have to clean out and keep up the house until it sells, and my husband and I are not rich. Sorry for the babble. Any suggestions you could give me would be appreciated. Basically, there could be rare stones worth real money. Hi Andrea, thanks for reaching out to us. 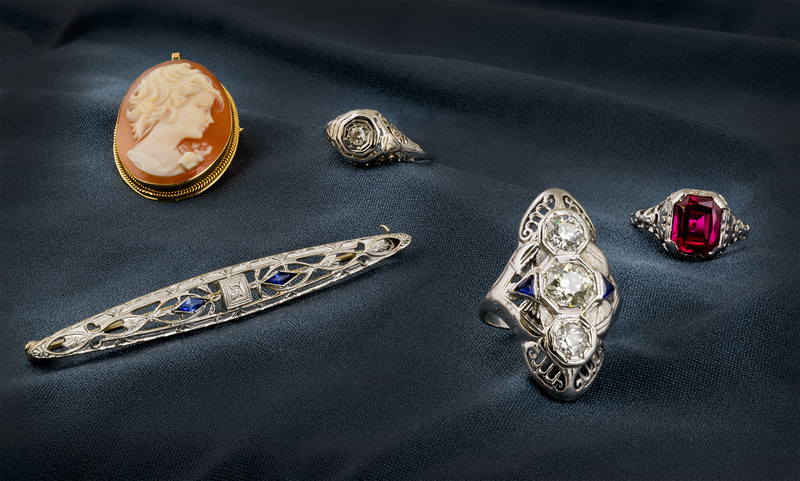 With an estate like that it can be difficult to separate the more valuable gems from the less valuable ones. You need the services of a skilled gemologist who is able to quickly and accurately identify gemstones. If you are in the Sacramento, CA area, we would be happy to help you evaluate the estate and find the most valuable gems. If not, we also buy and evaluate jewelry remotely (please email us for details). Otherwise, I would search for a local jewelry buyer with a GIA trained Graduate Gemologist on staff and a full gem lab. A friend passed away and left her jewelry to me. I will have to pay taxes on the appraised value before I can take possession (I live in one of THOSE states). Which appraisal value should I be taxed on? Will the appraiser tell me which one s/he has applied? What is reasonable to expect from her family member who has expressed interest in buying some pieces that have sentimental value? Hi Estelle, I’m sorry for your loss, and thank you for reaching out to us. Of course, we can’t give you legal advice, but in this situation, I would suggest asking the appraiser to be as conservative as possible on the evaluation. The appraiser may default to using the insurance replacement value which does not sound appropriate in this case. Ask them for the estate wholesale value or they may call it a cash value appraisal. I would also sell to the family member at these conservative values. Hi Susan, thanks for commenting. Explaining the difference between insurance value and market value is something that we do on a daily basis, and you are absolutely correct. It is very difficult and often leads to confusion and hurt feelings. If you haven’t already, you might want to read our blog on how jewelry is valued. There is a section in there that specially addresses this issue and includes some analogies that you may find helpful. Hi. Great article. I’m in a similar situation to another poster, Gary. I have inherited quite a bit of jewelry, most of it will be costume jewelry, although there are a couple of diamond rings. First, another poster mentioned that costume jewelry may still have some value, sometimes more than one might suspect. Do you find that to be the case? Also, how does one go about bringing in a large amount of jewelry (the diamonds and the costume jewelry) to a jeweler? How would you, for example, handle someone who had several jewelry boxes? I doubt a jeweler has the time to drop everything they are doing to go through all that material. I would be interested in the estate wholesale value, as I don’t like the idea of dealing with eBay and Craigslist, plus I’m not knowledgeable about jewelry at all. Unfortunately, I’m in Michigan, so I can’t just stop by to see you! Hi Brant, thank you. I’m glad you liked the article. Let me see if I can answer some of your questions. Unfortunately, most of the costume jewelry we come across isn’t worth a whole lot. However, if the costume jewelry is complete, undamaged, and from a recognizable name brand, it might have some good value. You can check and see what the market is by looking on eBay or Craigslist and trying to find similar pieces to what you have. I wish you were closer, as we have people bring in several boxes of estate jewelry quite often. We have gotten pretty fast at sorting through and separating the costume from the fine jewelry. I would say call ahead and carve out some time in your schedule. You will probably need to be flexible so that if the jeweler has another customer show up they can help them and then come back to helping you. We have also had people mail in large estates to us. But, before you do that please send us some good pictures of what you have, and use a strong magnet (i.e. rare earth magnet) to see if anything is magnetic. If a piece sticks to the magnet, its almost certainly costume jewelry and not something that we would buy. Feel free to contact us if you have any other questions. Very helpful article. Exactly what I was looking for to understand how jewelry can be valued for estate purposes. Thanks! I think I’d like to say thank you very much. My Mother passed away and I have a ton of jewelry which some I think is costume jewelry which I have been told by a friend can actually be worth more than I’d have ever thought, and then there are rings like the one that brought me here trying to understand what 10KP GTR means, well I’m not sure I found that answer but your article on Estate Jewelry is really great because I have a sister who cares about nothing except getting paid so this estate jewelry covered in your article gave me a good lead on how to do further research in order to deal with my sister and just pay her off, so thank you very much for writing this article..
Hi Gary, thanks for commenting, and I’m so glad to hear the article was helpful to you. To answer your question about the stamp, 10KP indicates that the piece is 10 karat plum gold (meaning it contains exactly 41.7% pure gold). You can read more about gold purity on our article here. The GTR portion of the stamp is a manufacturer’s mark indicating who made the ring. From a little research it looks like the stamp has been used by J.M. Fox, Inc. of Long Island City, NY and so they are the likely manufacturer of the piece. Hopefully that helps, and let us know if there’s anything else we can do for you.